Subtitled ‘An album in 1000 variations’, the new Icarus offering is, ambitiously, just that; a digital album with exactly 1000 copies available, all different, so whichever version you end up possessing will not be exactly quite as the one this, or any, reviewer has listened to and written about. This means that, whilst each owner of one copy of this record can have the satisfaction of owning something by definitely unique, as far as this particular copy is not duplicated in any way, and claim some of the rights should their particular version be licensed for commercial use, it also means that no one, including Ollie Bown and Sam Britton themselves possibly, will ever hear the project in its entirety. The music was created using conventional electronic instrumentation and tools, and is distributed via equally conventional file transfer technology, but uses generative techniques, allowing for the various parts of a recording to be assembled in slightly different ways. 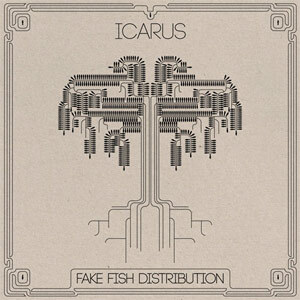 As Icarus themselves explain, Fake Fish Distribution ‘reinvigorates our understanding of what it means to own a “copy” of something, in an age where the contents of our music collections are not even distinct objects, but clones of the exact same bits that belong elsewhere to others’. FFD can therefore been seen as a reaction to music becoming a simple commodity, and an attempt to make each version, by nature, a truly singular product. The album, Icarus’s first studio recording in seven years, denotes a shift in tone from I Tweet The Birdy Electric (The Leaf Label, 2005) as Bown and Britton deploy resolutely more electronic-sounding textures and components here. Their sonic universe is as rich and colourful as it ever was, and still undeniably relies on a wealth of field recordings and processed acoustic sounds, but there is a mechanical aspect to the music which wasn’t quite as pronounced on Birdy Electric or the more recent Carnivalesque or Sylt, both built from live recordings. But, as ever with Icarus, what dominates the whole record is the pair’s exquisite flair for constructing incredibly detailed miniature worlds articulated around luxurious sound forms and textures which are as mysterious and evocative as they are complex and refined. If Fake Fish Distribution indeed sounds machine-like, what Bown and Britton expose here is a thoroughly enchanting collection of intricate clockwork, locks and engine mechanisms, each with its own particular timing and path. This can take a truly magical appearance, as is the case on Shallow Tree, with its chime-like shimmers and its subdued rhythmic patterns, or on the much more hectic Colour Field or denser and more linear Old D later on. Yet, it can also lead to some surprisingly sombre passages as pressure steadily builds up on Spineez Of Breakout through to MD Skillz, on which progress becomes much more chaotic as the piece is subjected to all sorts of twists and turns. Later on, Three Stupidities also shows signs of inner tensions as its components appear to be permanently pulled further apart, and closing piece Two Mbiras, whilst seemingly more straightforward, is caught between a numbing engine drone and dense textural formations. Over the years, Icarus have consistently sought new ways to interact with computers or somehow step out of the creative process, to a certain point, as they recently did for the Long Division project. Fake Fish Distribution is another step in this permanent quest as they question the very idea or reproducing music indefinitely. Beyond the concept though, the pair have created a rather wonderful record which introduces new elements to the Icarus palette whilst retaining the very essence of their work. Ultimately, this album may rely a lot on computer input, and may sound, at times, like an extremely complex machine, yet Ollie Bown and Sam Britton have perhaps created here their warmest and most human record to date. STEIM Residents: Icarus from STEIM Amsterdam on Vimeo. An enchanting album loud or soft. To my ear the state of the art was set with Tweet the Birdy and has been tinkered with since then and it is only now that there is something that takes it further. Intricate and rhythmic it is more accessible and interesting than Birdy (to my ear) but is not as strong thematically. Concentrating on the detail is a delightful journey inward. I have had it on loop since i purchased it. It is the payoff for following electronic music these past years. Thanks guys.